Another race another accident. This seems to be the common theme surrounding Max Verstappen these days. The latest person to voice his opinion on the matter, was 2016 Formula One World Champion, Nico Rosberg, who recently commented saying, "I don't have much hope for Verstappen" when pressed for his thoughts on the Dutchman. Now of all the incidents that occurred this year, the one in Monaco stands out the most, as it was pretty much a rehash of an incident that took place at the same venue 2 years ago, when the then 18-year-old stuffed his car into the wall right after claiming his first race win in the previous round. Read that statement again, Verstappen was an 18-year-old Grand Prix winner and therein lies the problem with writing him off so early in his career. Car racing and Formula One, in general, sees a large proportion of competitors come into their prime in their late 20's and early 30's. The first of Schumacher's five World Championships with Ferrari came in the year 2000 when he turned 31, Ayrton Senna won his three world titles during 1988, 1990 and 1991 when he was 28, 30 and 31 respectively. Fernando Alonso who is widely regarded as the best driver on the current grid, also claims some of his best years came when he was at Ferrari from 2010 to 2014, between when he was 28 and 33. Current World Champion Lewis Hamilton saw his period of dominance with Mercedes start from 2014 when he was 29. Yes, he had the fortune of having one of the most dominant cars in the sport's history, but if one were to look closely you could see that a large part of his McLaren career was filled with petulance and silly on-track incidents. Sebastian Vettel seems to be an exception to this rule, though time will tell if he is able to achieve as much with Ferrari as he did with Red Bull Racing. Coming back to Max, it's easy to forget that he is still only 20. Max already holds a host of youngest records in the sport, including youngest person to start a Grand Prix, the youngest person to set the fastest lap, the youngest person to finish on the podium, and the youngest person to win a Grand Prix. Further his drive at the 2016 Brazilian Grand Prix, showed a phenomenal understanding of grip levels in tricky conditions along with his amazing car control. A large part of people chooses to criticise him over his relative lack of a junior formula career. Verstappen jumped from karts to Formula 3 to Formula 1 in a matter of two years which led the FIA to create a litany of regulatory changes including one that bans anyone under the age of 18 from getting a Super License. This lack of experience is used as fodder by his critics, though up until this point he had more or less proved those same critics wrong with his on-track results especially in 2016 when he first signed for Red Bull Racing. There hasn't been a driver on the grid who has not had some level of criticism thrown at them at some point in their career. Warranted or not, drivers like Vettel, Hamilton, Kimi Raikkonen, and Alonso have all had their fair share of media bashing in recent times. Kimi Raikkonen was constantly accused of showing a lack of motivation during his first stint with Ferrari, and Fernando Alonso had to deal with the fall out from his fractured relationship with then McLaren principal Ron Dennis in 2007. Sticking with the theme of crashing, in 2010 Vettel was labeled a "Crash Kid" while 2011 saw a host of on-track incidents take place between Felipe Massa and Lewis Hamilton, with the Brit more often than not coming off as the guilty part. Both drivers currently have 4 World Championships each. To say Verstappen should be absolved of criticism is wrong, he has definitely been rash with his driving and his decision making while racing leaves a lot to be desired. His team cannot allow for further incidents as one it shows a lack of improvement and two at some point the damage bills will begin to pile up. That said the calls for Red Bull to drop him much like they did with Daniel Kvyat would be harsh. Verstappen has so far displayed far greater talent than what Kvyat did and with a little bit of maturity, he can definitely win a World Championship. Perhaps going down the route of Romain Grosjean and enlisting the help of a sport's psychologist might do the Dutchman some good. 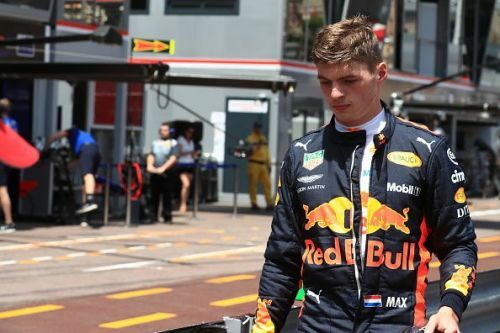 Fans too need to remember that little over a year ago they were hailing him as the sport's most exciting prospect and maybe given a bit of time and the right guidance, Max Verstappen may well live up to their expectations.